I have a pretty polish from Black Cat Lacquer to share with you today. I recently was gifted some Black Cat Lacquer's in a gift exchange that were on my wishlist. I've been trying to step up my indie game this year. I'm pretty slow at it, I admit, but I'm enjoying all that I've picked up. This color is no exception. 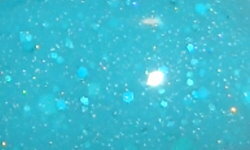 Demeter is a pastel teal crelly base with teal holographic glitters. Color: This is beautiful softened and muted teal shade. I love this color! I also love that it's a crelly glitter. Crelly glitters and jelly glitters are my favorite. I like how the glitter coincides with this base. This a beautiful glitter polish, but it's more subtle than multi-colored glitters. Formula: Excellent and easy to use formula. I used 2 coats above. Overall: Demeter is a beautiful glitter crelly polish. I love the color. The formula is great. I love that it's a simpler glitter, but still has the bling factor. I really gravitate toward colors like this because they give me the glitz, but don't go overboard. I like this one too although I don't have any Black Cats. I did take advantage of a sale at Mod Lacquers and ordered four colors yesterday (her Mid Mod collection is 30% off). Wow, that is really pretty!! This is my kind of color. Its gorgeous! This is super pretty; love the color!